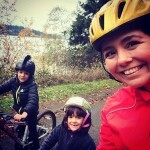 30 Days of Biking in April: Pledge to Ride to Show WA Bikes! Some bike events are all about the time, as in racing. 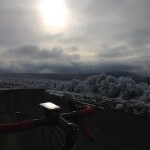 Others are all about the distance, like Ride Across America. Some require you to stop at specific destinations, whether you’re randonneuring or coffeeneuring (which we’ll remind you about come September, when that caffeine-fueled challenge gets rolling). Other bike events help motivate you to ride with others in your community during Bike to Work Week (let us know if we’re missing your town in our list of Washington state Bike to Work Week events), or for month after month in the National Bike Challenge from April through September. And then there’s riding just to ride. Every. Single. Day. 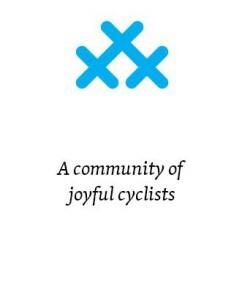 That’s what 30 Days of Biking asks you to pledge, inviting you to join “a community of joyful cyclists.” Every ride, no matter how short, counts. If you have to ride your bike around the block in the dark after you get home late on a day that for some reason didn’t include riding, you do it just to check the box. Something magical can happen, though, that makes it more than checking the box. A short ride after dark–maybe through your neighborhood with a friend or sweetheart who indulges your crazy “I have to ride even if it’s just around the block!” invitation–can give you a new perspective on your street. If you’re like me, a regular commuting habit makes it easier to get miles in during the week than on weekends, whereas if you’re a weekend rider you have to think about working in rides to get to work or school, to run errands, to take in a movie, or to hit the transit stop on weekdays. You can choose to blog every day, take a picture every day, take a different route to work every day–any number of ways exist to help you mix it up a bit if you’ve fallen into a riding rut. Some years I’ve pledged and succeeded (April 2013, September 2011). Some years I’ve pledged and not made it for various reasons. I’ve already signed up for this April and am looking at some of the great bike rides I haven’t ridden yet as one way to get some of those weekend days checked off, such as the Daffodil Classic April 13 in Orting, and the Lilac City Century April 27 in Spokane. I’ll be in eastern Washington for the Spokane Bike Swap so I’ll ride to that. I’ll also check the Cascade Bicycle Club ride calendar and look for a Critical Lass Seattle ride. In Minneapolis where the challenge was founded they hold a March 30 warm-up ride; in the Seattle area I could ride the PATH (Pedal Against Trafficking Humans) Ride on Mercer Island. 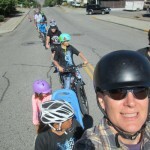 The many bike clubs around Washington state organize rides that can give you some company; check them out even if you’ve never ridden with a group. No matter how you accomplish it or how long you’ve been riding, 30 Days of Biking can give you new riding experiences and fresh perspectives on familiar streets. We’re writing about this now so you can plan ahead. If you’re not a winter rider, it’s time to get the bike out of storage, check those brakes, and get a tune-up at your local bike shop if you need one. If you are a winter rider, you really need to check those brakes because the grit has probably been wearing down your pads, and maybe even your wheels. Pledge to ride and then tell us how you’re doing at keeping up via comments here, on our Facebook page, or on Twitter, Instagram and Vine with the tag #30daysofbiking. On Twitter include @WAbikes in your tweet so we can see your reports and encourage you to keep it up. Share a link here if you write about this on your own blog, or consider writing a guest post for us about your experience. I’ll check in to let you know how I’m doing too–having to tell you all how I’m doing may be just the incentive I need to stay on track. What would keep you from completing the challenge? What can you do to overcome those issues? If you post them here we can all help you work through them. 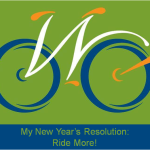 30 Days of Biking September 2015: Are You In? This article was posted in Attitudes, Events, News. Bookmark the permalink. Follow comments with the RSS feed for this post. Both comments and trackbacks are closed. Way to go, Maggie! We’ve been hearing from people on Twitter that they’re pledging and we’ll be posting YAY YOU! comments there and on Facebook. Now that I live in town I try to ride every day to work! I feel better when I do!